Octopath Traveler is traditional fantasy Role-playing-game published from both Nintendo and Square Enix. A game I was looking forward to getting into, including some turn-based combat. My Octopath Traveler review was quite the adventure and took some hours too! There is a lot to like about this Nintendo Switch exclusive. Each character has their own unique story arc. It has a 90’s RPG look and feel to it and could easily have been part of the Final Fantasy generation of games. Octopath traveller also features some wonderful story-driven campaign adventures, dungeon crawling and boss fights. All packaged in a world where you bring the 8 characters together to make a difference. It’s a shame some of it becomes a bit of a grind, but I really did enjoy this experience. How does Octopath Traveller play? If you’ve played any of the Final Fantasy genre games from the 90’s you will be familiar with the gameplay and style of Octopath Traveller. Octopath Traveller feels like a retro RPG game done for new hardware. The gameplay is heavy on story dialogue conversation boxes. Anyone familiar with the JRPG will know that conversations include a lot of Action button presses to progress. You might be tempted to skip the dialogue if you’re short on patience but doing this will mean that you will miss most of the storytelling, given you need to read the majority of it. Underneath the visuals are the detailed RPG character management and customisation elements. Octopath Traveller has the usual range of characters that you will find in most JRPG titles such as fighter; healer; hunter; ranged; thief; paladin; wizard. However, they are cleverly hidden under different roles. For example Primrose the Dancer is a DPS based rogue type character who is, in reality, a prostitute trying to escape from her miserable life and pimp. I found each of the different character stories fairly unique and, whilst they mostly followed generic stereotypical roles, each of the stories were fun to complete. Each character has a specific role or job. Octopath Traveller describes this as Primary Role. For example, Therion is a thief, his main primary job is Thief and he can select skills from that ability tree. The skills are typically focussed around attacking quickly, critically and applying weaknesses to enemies. He has a path action that allows him to ‘steal items’ from NPC characters. His class talent is ‘picking locks’ allowing you to open chests that you find in your travels. Later in his story, you can unlock a second job role which allows the creation of dual class characters (without their path action). The fun comes from assembling your party of 4 characters and using them in combat. This turn-based system features several battle components. Each character can accumulate special attack (boost) points in combat allowing more powerful actions. Other characters utilise the traditional support roles such as healing and buffing (providing positive bonuses to attack stats). I also liked how some of the support characters could summon assist character in fights. The hunter can summon captured beasts (like Pokemon) to fight for her and the Dancer can summon followers to fight for her. Each fight typically uses a rock, paper, scissors style enemy vulnerability in the form of weapon or magical element. Initially, you have to work out which one works the best by trial and error, but after a while, you can remember which enemy has certain weaknesses. I found the battle combat rewarding and enjoyable with plenty of scope for customisation of character attack skills and development. Boss fights are the most fun and you need to really think about your strategy of attack to be successful. 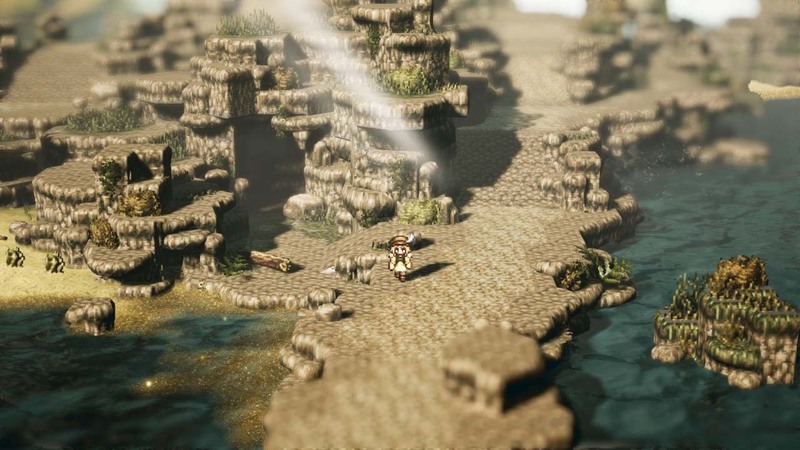 Octopath Traveller has a retro 90’s RPG design to it. Graphically the game utilises a fancy design called 2D-HD, this means classic looking 2 Dimensional characters in a 3 Dimensional Environment. Despite being in HD the world and characters have a distinct 8-16 bit look to them. I really liked the graphical design as it felt at the same time modern and also nostalgic for the 90’s era of games. The world of Osterra is lavishly drawn and detailed and despite the limited colours and pixelated environments, it is a joy to look at. In docked mode on a large TV, you can see more of the pixelation and I preferred to play on the smaller screen in handheld mode. Apart from that graphically the display modes don’t differ. You can also use a different control peripheral if you wish, I preferred to use the JoyCons in handheld mode and the competition pro pad in docked tv mode for comfort. Game incidental music is something that I really enjoyed. Each of the pieces of music fit beautifully into the different stories and I’m going to look into purchasing the instrumental soundtrack. As I said earlier voice acting is replaced by text dialogue boxes. However, each character has a limited set of audio dialogue that is spoken during combat. I know some of the quotes were a bit cringe-worthy and some feel a bit lost in translation but they do add to the atmosphere (even for the hundredth time you hear them!). 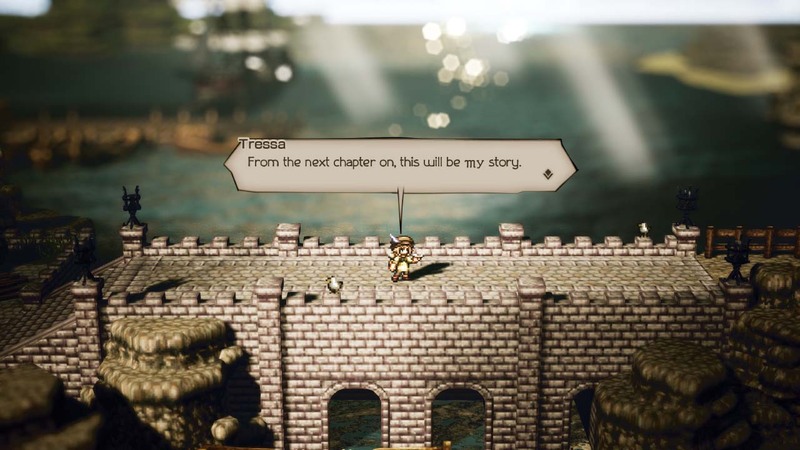 Octopath Traveller is a story-driven role-playing game. At the beginning of the game, you choose one of the eight characters and commence with their story. After completing that story you journey across the map in search of another character. This mechanic enables you to assemble a party of characters to face harder level challenges, dungeons and boss fights. Each of the individual stories lasts 4 chapters and in total there are 32 chapters spread across the map. Access to these chapters will depend on which starting character you chose, level entry requirements and where you are located. They follow the same pattern for each story, an introduction, complete a task (to learn the path skill action), a dungeon style romp followed by a boss fight. Should You Play Octopath Traveller? If you enjoy traditional RPG’s you will enjoy Octopath Traveller. I enjoyed the journey, the storytelling and the character development. Some parts of the game can be slightly repetitive such early combat and some dungeons. The first few chapters of the story of each character can feel similar. But I honestly felt that if you read all the dialogue and don’t skip past it during conversations you won’t lose focus. Sometimes I did find that I got stuck in certain areas and needed to use trial and error to succeed. 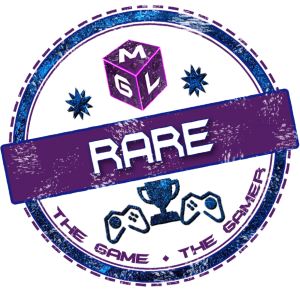 I also often came up against level cap restrictions exploring new areas which required me to ‘Grind’ a few more levels via combat to allow me to access. 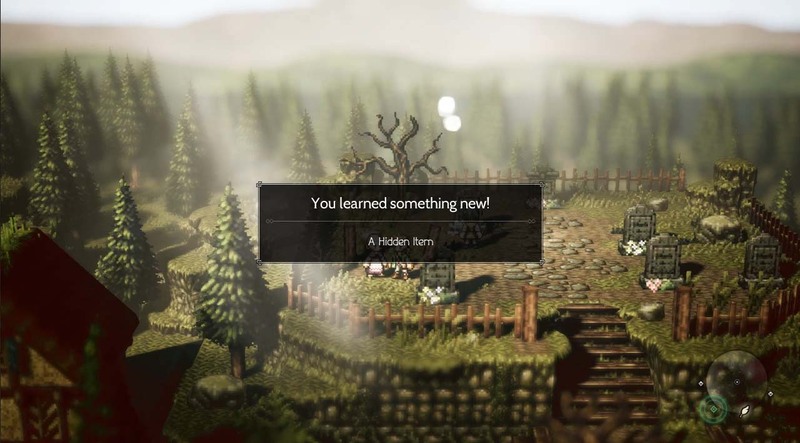 Octopath Traveller rewards gamers who are willing to put the time and effort into it. Fans of RPG games will enjoy if you have played Bravery Default you will enjoy this game. Newcomers to the genre might be curious and I recommend downloading the demo to try before you buy. The demo allows you to play a part of the full game and then transfer your progress to the full title after purchase. You've read our review, and maybe a few others on this title. Are you interested in getting Octopath Traveler? Have you already played it? 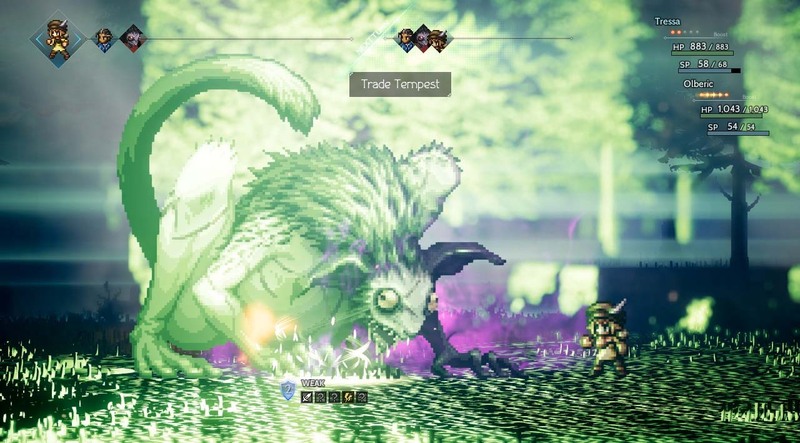 Game Reviewed: Octopath Traveler digital edition, provided by the publisher.